A legendary musical ensemble, the Juilliard String Quartet, with its long history, voluminous discography and distinctive distinctions, arrives on January 20, Protected content a single concert at the Thessaloniki Concert Hall. 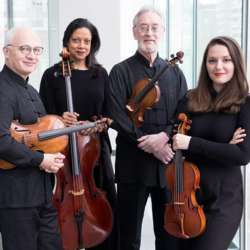 The world's top string quartet was founded in Protected content the famous The Juilliard School of Music in New York and its members, who are always professors of the School, are refreshed from time to time. Currently, the quartet is made up of Ronald Copes (violin), Roger Tapping (viola), Astrid Schween (cello), and his most recent member is a Greek and Thessaloniki, Areti Zoula, who joined in the shape as the first violin last September! The concert of the quartet at the Thessaloniki Concert Hall will be her first appearance in her hometown with this figure. In his 72-year history, the Juilliard String Quartet has become famous for its unsurpassed craftsmanship and craftmanship, as well as for its vast repertoire, ranging from classical works to the younger composers, some of whom have dedicated them to their works . The quartet's famous discography includes over Protected content and four Grammy awards, one of which is the Lifetime Achievement Award, a prize honoring artists for their total music offerings. This great musical event of the Juilliard String Quartet concert in Thessaloniki is part of the long tour of the scheme in Europe, Asia and America. The program to be presented includes works by Hayden, Bartok and Beethoven. Ludwig van Beethoven ( Protected content ) - String Quartet in E-minor, op. 59 Nr. 2, "Razumowsky"
Call or sms me in order your attendance to be valid and to resevre your seats on time.